CLEARFIELD – The Clearfield Area United Way is making it easier for area residents to get help with prescription medication costs. In fact, area residents have saved more than $50,000 through the FamilyWize Prescription Discount Program. When you get the free discount card, you can present it at an area pharmacy. The pharmacy will automatically apply the discount to the cost of your medicine. Savings with FamilyWize typically average 45 percent, according to Nancy Pinto of the Clearfield Area United Way. People who work for businesses that don’t offer insurance, have declined coverage, work part-time or are laid off. Families and individuals who have high deductibles and waiting periods, who need a medication not covered by their plan, who have a co-pay higher than the Familywizediscounted price or who are on a limited catastrophic plan. FamilyWize was founded in Bethlehem, Pa., in 2005. Since then, it has helped more than 11 million people save $1 billion nationwide. 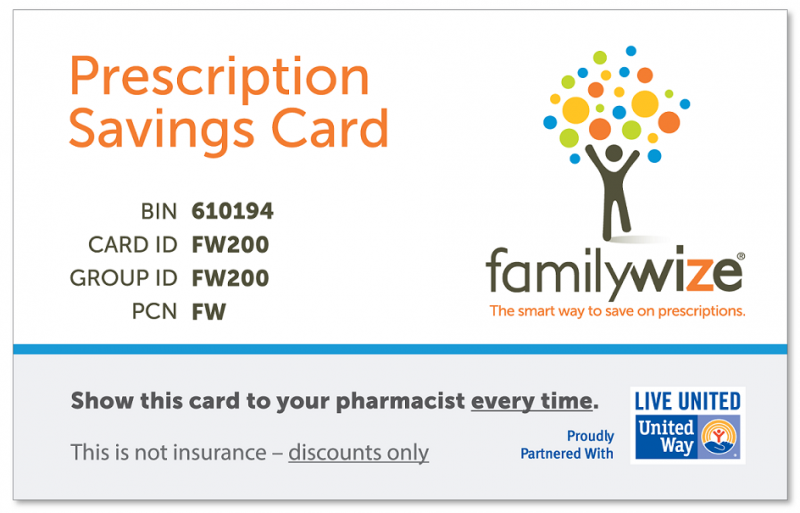 To download its free card or mobile app, you can: visit www.familywize.org; text the word “Family” to 700-700; or call CAUW at 814-765-6521 to have the re-usable card, accepted by major pharmacies nationwide, mailed to your home.